Brian Evans should have made the Basketball Hall of Fame before Jim Rice made the…huh? wha?? Boston Red Sox legend Jim Rice, a member of The Baseball Hall of Fame, has just completed a new TV commercial which will promote the new single “At Fenway,” now on sale at Best Buy and Amazon.com. After debuting at #3 on Amazon.com, astonishing given the single was released in November, during football season, the commercial was filmed last Monday at The Groveland Diner in Groveland, Massachusetts. ...“Red Sox Nation is everywhere. This has truly been a D2F (Direct to Fan) campaign at this point, and we’re blown away at the response to the song,” says Evans. Just so he can play with The Remains! Theo Epstein, the former Red Sox general manager, will return home this weekend to help host the semi-annual “Hot Stove Cool Music” charity concert that launched 12 years ago. Legendary baseball journalist Peter Gammons and a slew of musical performers will join Epstein, a Brookline native, at the Paradise Rock Club in Allston for Saturday night’s fundraiser – three months after he resigned as general manager of the Red Sox to lead baseball operations for the Chicago Cubs. ...Boston-native actor Mike O’Malley, who plays a regular role on the TV series “Glee” will emcee the gathering that includes scheduled performers: Grammy award-nominated, Boston-native Susan Tedeschi, Boston rockers The Remains, Grammy award-winning guitarist Derek Trucks, indie folk band Deer Tick, indie rockers Mean Creek, garage punk band The Sprained Ankles and the “Hot Stove All-Stars” featuring Gammons, Buffalo Tom’s Bill Janovitz, indie rocker Kay Hanley, J. Geils Band’s Seth Justman, folk rocker Robin Lane, Grammy nominated singer/songwriter Tanya Donelly and more, organizers said. Kicking TBS: Live in Atlanta…with Dale Murphy. Q: Probably not a lot of 50-something former MVPs can say they’ve been getting into Wilco and other bands, huh? A: Well it’s been fun, and I think that’s the fun of Twitter – this intersection or cross-section of diverse people and interests, and you connect in ways … it’s been fun. In fact, I did a [online interview] with Peter Moylan, and he was asking me about music I listen to. And he and Chipper [Jones] were wondering who half the bands were that I named…. [Laughter.] I’m going to have a contest on Twitter and say the first hitter that walks up to [to the plate] with Wilco or something like that playing, I’m going to get him [a prize]. Q: OK, let’s change gears a bit. Murph, has this time of year become frustrating for you because of the annual Hall of Fame voting announcement? Or do you still allow yourself to be optimistic about your chances? A: I’m always kind of optimistic. Not really frustrated, I think because my percentage [of votes] hasn’t really been knocking on the door, you know? I think if it’d been at 60 percent or something for five years, it might be different. I mean, I always try to be optimistic. I know my percentage is pretty low and you need 75. And I’m not really close. So in that way I’m not really frustrated. To be honest, I thought my percentage would be higher over the years. It hasn’t been high. I tend to feel like I’ll get a bump this year. We’ll see. There’s been some talk about guys that played in the ‘70s and ‘80s, that there might be some revisiting of their careers [by voters], and I have some people that have been supportive. So we’ll see. I appreciate the support and I try to stay optimistic. Where Does Target Field Concert Cash Go? $300 to see Kenny Cheney and Tim McGraw? That’s the shitkickingest thing I’ve seen since Elton Britt ran for President in 1960! If taxpayers pick up the tab for a new sports stadium which later hosts a concert, where does that money go and does the public get a kickback for their investment? That’s a question currently occupying many minds after the first concert at Target Field sold out in only four hours. FOX 9 News reporter Tom Lyden began looking for the answer after a viewer e-mailed, asking if the team pockets all the profits from the concerts held at the ballpark—but when it comes to the money trail, there are few simple answers with public stadiums. Baseball may be the game of the summer, but Target Field is now proving that there’s big money to be made beyond baseball. Soon, about 39,000 country music fans will pack the house to see Kenny Cheney and Tim McGraw. Some fans even shelled out $300 per ticket. So who gets that money? Twins spokesman Keven Smith says he wishes they did, but the concert promoter and performers take in all the money generated at the gate. The Twins keep the concessions cash—but they don’t know how much that will amount to. Nickelback? Foo Fighters?.....You’d think Moylan would be touting the Mangel Wankers or something, but nooooo. Embattled rock band Nickelback have found themselves in the middle of another sports controversy—a Twitter fight with Peter Moylan, a relief pitcher for the Atlanta Braves baseball team. Moylan threw the first high heater after attending the Foo Fighters’ Dec. 2 show at AAMI Park in Melbourne, Australia, tweeting how much more he liked Dave Grohl’s band than Chad Kroeger’s. “Note to @nickelback please attend a @foofighters concert. That’s how’s it should be done chad,” he wrote. Nickelback, who’ve been drinking their fair share of haterade lately on account of their unpopular football half-time shows, were quick to respond with kind words for the Foos and a baseball-savvy burn for Moylan. “@PeterMoylan Foos are killer for sure. We’re doing just fine too thanks. ? for you Pete, is watching Kimbrel better from the bench or on TV?” the band tweeted. Billy Joel? Elton John? Paul McCartney? Screw the wrecking ball…bring in the mofo Wrecking Crew to tear these MOR (Middle Of the yellow brick Road) ####-tinklers down! Though we were steadfastly resistant to Joel’s music during its heyday, the passage of time has softened the edges of his work: like Elton John (with whom he began touring after giving up songwriting in the 90s), his gift for melody ultimately forgives many sins. If one had to knock down Shea Stadium, Billy was indisputably the man to give it its sendoff. The filmmakers knew they were creating too many narratives for their film to escape a feeling of it being neither fish nor fowl, so they found a fourth strand that gives it a semblance of narrative drive—they relate Shea Stadium’s history to the iconic event of its youth, the 1965 Beatles concert. This fourth layer provides a musical link between Joel and the Moptops, and injects suspense into the unfolding story: will Paul McCartney find a way to appear at Joel’s farewell to Shea? Will things come full circle before the wrecking ball? Tell me when it’s over, Steve…please tell me when this is all over. Among those rooting for the Brewers to reach the World Series may have been the band, the Baseball Project. While none of the members are Milwaukee fans (or Cardinals fans), they did have a gig lined up for the Milwaukee if the Brewers made the World Series—but you know the rest of the baseball side of the story. Ugh, more crapthetic tie-in crap…meanwhile Shiitty/Awesome gets passed over again! Game 7 of the World Series is slated to air on Friday night, and for the second time during the baseball classic we are going to have an “American Idol” alum performing the National Anthem. Who is it going to be? According to reports, Chris Daughtry is going to be taking to the field in order to sing “The Star-Spangled Banner” just a week or so after season 10 champ Scotty McCreery performed the same song. Daughtry is also the third artist with direct Fox ties to perform, as “New Girl” star Zooey Deschanel has also taken on the anthem. George Thorogood is no Doug Sahm. Who would you rather party with—the 1969 Mets or the 1986 Mets? Oh, the ‘86 Mets. They’re closer in age to me. ... My idea of partying is sitting at a bar and nursing a beer for two hours and talking baseball. I did that in Pittsburgh once. I was with Ed Lynch and Keith Hernandez, and for about three hours we went through two beers and 50 years of baseball. That’s my idea of partying. Keith Hernandez is great to talk to. He’s my favorite announcer. He’s articulate. He’s intellectual. He knows the game. He comes from a side that’s not a real jock side. He’s got a style, and I really enjoy his approach to the game. You know what Keith Hernandez once said? He said he couldn’t get interested in the game until his team was losing by about three runs. He didn’t think the game was interesting until then. Isn’t that amazing? That’s a champion. Joe Montana didn’t start playing [hard] until the fourth quarter, when his team was down by two touchdowns. Keith’s brain would wake up down by three runs. He’d say, “Now the game’s interesting to me. If we’re up 10-0, it doesn’t mean anything.” That’s a real gamer. Do you have any baseball mementos or memorabilia? WATCHING I like music documentaries. I just recently saw “We Jam Econo — The Story of the Minutemen,” who were a California punk band from the ’80s. 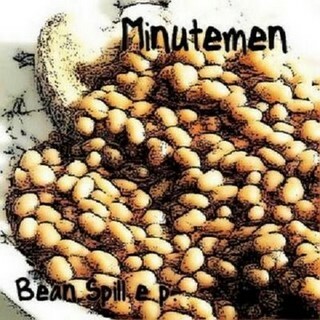 The Minutemen were one of those bands that didn’t really catch on in the mainstream and yet was incredibly influential on other artists that did make it. The other one that I saw was “Hype!,” which is about the Seattle grunge scene. It has great archive footage of bands like Nirvana and Sound Garden and also Alice in Chains playing in the Seattle bar scene. It’s interesting how clusters of bands develop in certain areas. LISTENING I listen to a lot of podcasts. My favorite is World Football Daily. It’s a two-hour soccer podcast. It’s got a lot of correspondents from all over the world who cover soccer. My go-to band is Oasis, but I have a friend in the music business who keeps me up to date with newer stuff, some of which I like, some I don’t. He recently introduced me to Glasvegas and Cold Cave. As organizers of “The Derek Jeter Plays” can attest, not just theatrical characters find “El Capitan” inspiring. So Algonquin Seaport Theater put out a call and got more than 30 submissions. The seven plays selected are part of an evening of one-act plays called “The Derek Jeter Plays,” and they all involve baseball and the Bronx Bomber. As for O’Reilly, she’s thrilled to play alongside her favorite guy, at least on stage, in “Pasta Diving Jeter,” about a crazy fan like herself. “I haven’t been arrested or, you know, have any restraining orders out or anything like that, but I would consider myself more fanatical then fan,” says O’Reilly. Closers need these songs more than anyone. Pitching just one inning to end the game, they rely on elements of intimidation that workhorse starters can’t sustain over six or seven innings. Closers are performers in the full sense of the word, and their entrance music is nearly as much a part of their personas as a filthy slider or 97-mph fastball. Yet few understand what makes a good entrance song. They have much to learn. Most of which, incidentally, can be found in the following guide. ¡Oye como va! 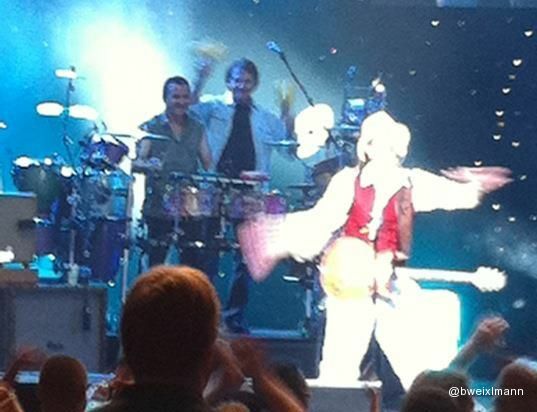 It’s not hard to make out the blurry figure with his arms raised behind the percussionst. That’s St. Louis Cardinals skipper Tony La Russa providing a little backup for legendary musician Carlos Santana at a recent show. Citizen Ben Weixlmann thought that some might not believe him, so he tweeted a photo of La Russa, (pretty much) plain as day on stage at the historic Fox Theatre in St. Louis during Santana’s concert Tuesday night. La Russa reportedly scooted over there after his postgame media session at Busch Stadium concluded. And there he is, just like the ocean under the moon! He’s even smiling, which is not something you usually see from The Genius. Only because…Johnny Giavotella got his pop gun! Along with his 26 bombs, Trumbo has driven in 80 runs, collected 55 extra base hits and has a .486 slugging percentage percentage, leading the team in all four categories. And he came up with probably the Angels’ biggest hit of the season against the Rangers on August 18, when he slammed a two-run homer off reliever Mike Adams to give his team a 2-1 win, and keep them within six games of the leaders. Without the shot, LA is swept by Texas, falls eight games out, and likely says goodbye to any post-season participation. They’ve gone 12-6 since that win, cutting 2 1/2 games off the lead. Not bad for a guy who was about to become a platoon player when he was struggling and the Angels acquired power hitting first baseman Russell Branyan in late May. For most of his life, my brother believed that there was a direct correlation between the Montreal Expos’ fortunes and his own. (Given my brother’s occasional happiness and success, the theory was dubious from the start, and it would finally be disproved in 2004 when the Expos were given a name-change and moved to Washington and he was not.) In 1981, the Expos made the playoffs for the first and only time in franchise history, but were defeated by the Dodgers in the National League Championship Series. The final game, which was played on a drizzly Monday and was decided by a late-game home-run by Rick Monday, would come to be known by Expos fans as Blue Monday. My sister was never a sports fan. She preferred art to athletics and my earliest memories of her are my earliest musical memories: “Blue Monday” or the Happy Mondays or The Chills emanating muffled through the closed door of her room - music that has persistently shaped my understanding of how the world sounded at the time I came into it. Ten years after Blue Monday, I cared a lot more about Fernando Velenzuala than I did about The Chills. Ten years after that, baseball had lost its appeal and music had replaced it in the forefront of my mind. Nearly ten years hence, I think about music less than I used to and baseball almost not at all, though I still derive great pleasure from The Chills and can’t help but think of Fernando Velenzuala as I listen. Ronnie’s Wallbangers are this week’s cover boys. Yep, they’re jinxed. Happy hour in the Brewers’ clubhouse starts early, with Morgan flexing in two coats of baby oil, Axford scanning the room for the putters used in naked golf, and the team listening to a head-rattling mash-up of music ranging from Marilyn Manson to Lil Wayne. In the dugout the starting pitchers recline in their personal cushioned chairs, including one they claim has supernatural powers to improve changeups. Batters commemorate hits by raising their claws and growling like beasts from the movie Monsters, Inc. They celebrate walk-off wins by punching one another in the kidneys. All teams have customized handshakes ... but the Brewers have customized handshakes with their security guards. If baseball players are the pillars of one model of orderly society, art is littered with the corpses of social outcasts. Nietzsche and Van Gogh went crazy. Dostoyevsky was politically oppressed. Brian Wilson couldn’t get out of bed for a decade. But there’s a reason why A&E can get away with running low-budget shows like “Hoarders” and “Intervention” back-to-back for 24 hours at a time. Even in the baseball universe, we can’t escape the pull of human-interest stories. Roy Halladay didn’t become the best pitcher in baseball until he was forced to reinvent himself in low-A ball. Josh Hamilton recovered from hard drug addiction. Zack Greinke overcame anxiety. Of course, the oft-repeated stories are always about the successful recoveries – the Lenny Dykstras and Ken Caminitis who fall victim to their own excesses are relegated to occasional fine-print bulletins and lamentful obituaries. They become “True Hollywood Stories” or the subjects of sanguine television movies. Jacoby Ellsbury was born three days before Amy Winehouse. Think about that for a second. Jacoby Ellsbury is older than Amy Winehouse. In a game in which an early middle-aged man is referred to as a “shell” or a “corpse” by cynical commentators and some men shift to the coaching ranks in their mid-thirties, Ellsbury is a paragon of youth. He’s 27 and he’s having the best year of his career – hitting .300, stealing a ton of bases and just now adding power to the mix. He’s emerging as one of the best young – emphasis on young – players in the game today. To say that he’s still very much alive would be understating the point. From “Doin’ That Rags” to “John Cumberland Blues”...all shitz, no hitz! 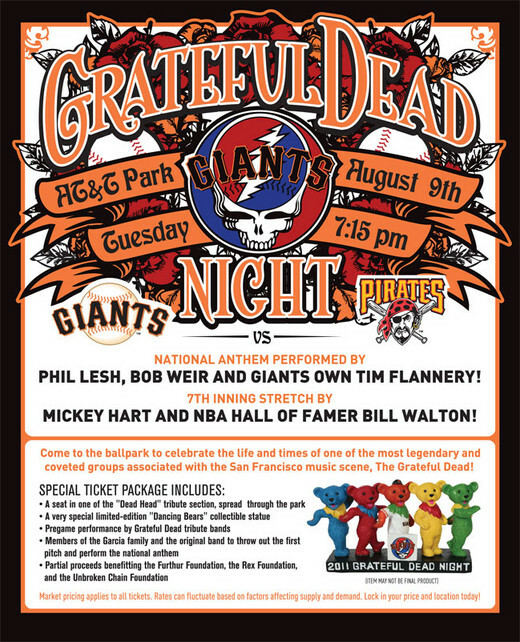 Come to the ballpark to celebrate the lives and times of one of the most legendary and coveted groups associated with the San Francisco music scene, The Grateful Dead! Your special event ticket package includes a seat in the “Dead Head” tribute section and a very special limited-edition “Dancing Bears” collectible statue. Grateful Dead tribute bands will perform prior to the game, and members of the Garcia family and the original band will be on hand to throw out the first pitch, perform the National Anthem and much more - stay tuned for further details.